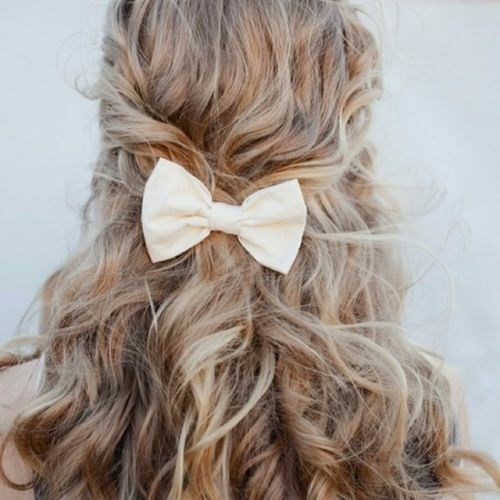 I think my inner 8 year old self is determining my hairstyle of choice right now…the curled “half up-half down” with giant bow!!! Now I would normally show you this look with my own hair, but I have to tell you that it is extremely hard to get a picture of this by myself. Lets just say I ended up with numerous pictures of the bathroom floor and ceiling…hehe. Now looking at these pictures I feel like this hairstyle is so cheerleader-y. Which is why I probably like it so much…I guess it is time to admit it…I was cheerleader for over 6 years!!! I also need such a lovely big bow <3 In wine red!! Oh, that would be so cute!!! I love bows to and I am a cheerleader! I have even started my own bow shop I am so in love with them! Previous Previous post: Welcome to the Jungle! Next Next post: Rainy City Nights Are The Prettiest!